Just wondering if you spearing Octopus is legal or not? ive never seen an Octopus off south florida waters yet but I do know that are around sometimes. I do love eating octopus so I was wondering if I can legally shoot them or grab them if I see one? You rarely see octopus in Florida waters, safe to asume there are not many around and I would not take any as they are so rare. They are cheap in the Asian markets. maybe theyre just lowkey and hard to find? probably not but I did call FWC marine and they did tell me that the common octopus is legal up to 100lbs any quantity but the other cephalopods are 5 octopi each. We see them on the west coast in the winter; even catch them on a hook occasionally from the boat. Apparently they like to eat stone crabs. While fossil hunting off Venice beach, FL, we have found baby octos in whelk shells. Most were about the size of a quarter and were returned to the water. Many years ago at Bradenton Beach like in the 60s on the beach at extreme low tide in the winter. The Octopus would have at high tide run the stone crabs up into the erosion groins rocks. At low tide there were hundreds of stone crabs out of the water. You could see several octos feeding on the crabs in shallow water of the still submerged rocks of the groins. We would collect stone crabs in 5 gallon buckets, no regulations on anything in those days. Wow. 'ems my stomping grounds. 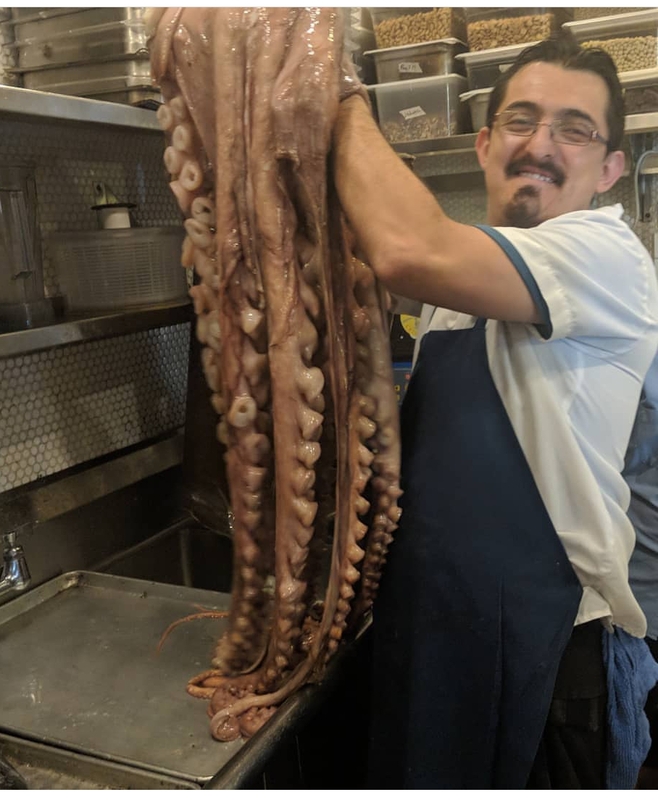 I took a very nice sized octo (~3.5') in about a 100' of water. It was quite a battle as it was holed up in a rock pile. I was fighting it trying to get it out of the hole when it almost took my knife away from me...admirable foe. After battling it for a while, I looked around and seen another hole nearby...with an eyeball staring at me. Sneaky thing was looking out of one hole while fighting me thru the other. A couple knife jabs in the other hole and he was done. Damn good eating. Tricky preparing it right. Octopus was real delicacy on Guam where I live for six years. They knew how to cook it and it had to be cooked perfect or it was too rubbery. Not worth messing with since they are easily available in the Asian Markets. Best grouper bait on our coast for grouper. Most commercial fisherman will arm wrestle for first turn dropping him back down for a grouper battle. We get the odd one on a throw up of another fish just boated, so they are quickly hooked up and sent back down. Its almost money in the bank on a nice grouper or snapper hook up. But there is plenty of them out there, a commercial stone crab buddy we know complains about them getting his crabs. I've seen and caught a few over the years in Southeast Florida while beach diving for lobster at night. I would hunt for them at night if they were my target. Yes it's legal to catch and keep octopus in Florida. I have caught several of them while beach diving in South Florida. I don't eat them but my family does and they say octopus taste good.